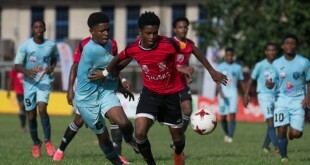 Defence Force FC missed a chance to reclaim the lead of the CNG National Super League (NLS) Premiership Division today as the “Teteron Boys” were held 1-1 in Tobago by third placed 1976 FC Phoenix. 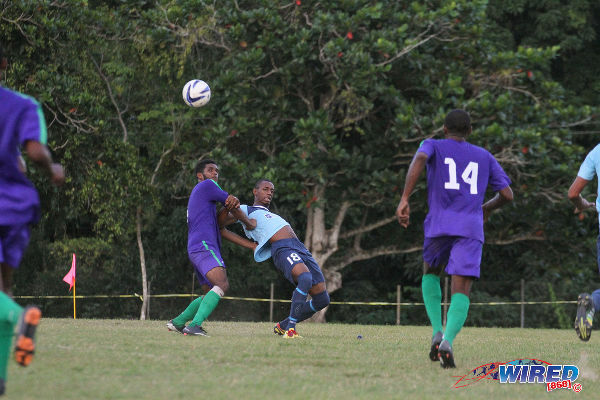 Photo: Defence Force midfielder Josimar Belgrave (right) beats Guaya United winger Collin Samuel (left) for the ball while Defence Force captain Chris Durity looks on during previous NSL action. The Army/Coast Guard combination are now level with leaders Guaya United on 31 points but trail on goal difference. Phoenix have 24 points. Elsewhere in Tobago, NLCB La Horquetta SA failed to hold on to a three goal advantage at the Montgomery Recreation Ground, as they were caught 3-3 by Bethel United. Bethel scored twice in the final four minutes from Azimodeen Leith and Kelvon Charles. The result means that La Horquetta stay 13th in the 15 team table and three points shy of Bethel and Matura ReUnited, who are 11th and 12th respectively. The bottom three clubs will be relegated to the Championship Division at the end of the season. Matura was also in action today but failed to register a goal in a 0-0 draw at home to table proppers, Stokely Vale FC, at the Matura Recreation Ground. Remarkably, the fourth and final fixture today was also a draw. There were five second half goals in Maracas where visitors Police FC and Real Maracas played to a free scoring 3-3 tie. 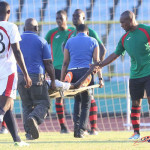 Photo: Real Maracas player Andell Allsop (centre) is dragged to the ground by a Club Sando player during previous NSL action. Real Maracas are in 14th position with 12 points, one short of La Horquetta, while Police are in eighth place with 19 points. The NSL will kick off its first knock out competition on Sunday with nine fixtures nationwide. Teams from the Premiership and Championship Division will face each other. Stokely Vale FC v QPCC, 5 pm, Plymouth Recreation Ground. 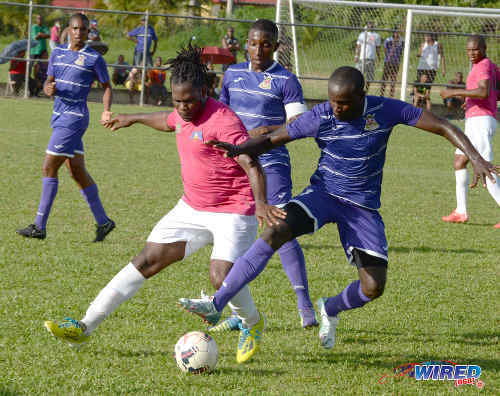 Photo: Petit Valley midfielder David Charles (left) holds off a QPC player (centre) while Benedict Barrett looks on during previous CNG NSL action at the Queen’s Park Oval. 1976 FC Phoenix 1 (LeJandro Williams 36), Defence Force 1 (Keston Williams 22) at Canaan.